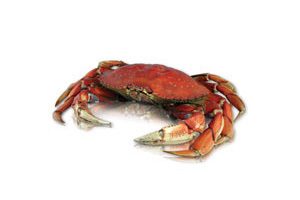 Most non-live crabs are sold pre-cooked. If you wish to serve them hot, take care to only reheat them briefly rather than actually cooking them…they’re already safe to eat and cooking them further can damage their delicious flavor and tender texture. Below are the methods we recommend for heating both king crab legs and snow crab legs – boiling, broiling, or steaming. Thaw all frozen crab legs before cooking (general thawing tips). 1. Fill a deep frying pan or wide pot with the crab legs and just enough water to cover. 2. Bring the water to a boil, then reduce the heat to a simmer. 3. Cover and let cook. After about four minutes remove the crab legs from the water, drain and serve. Snow crab leg clusters, whole Dungeness crabs, and whole blue crabs can also be boiled with potatoes, corn on the cob, spicy sausage and (optionally) live mussels or clams as part of a seafood boil. Be sure to add them at the very end and cook just until heated through. Check out our seafood boil seasoning recipe for a great spice blend to add to your boiling water. 1. Fill a large pot with about an inch of water. 2. Bring the water to a boil, then add a steamer basket with your crab legs. 3. Steam until heated through (about five minutes). Serve. 1. Set a broiler pan with crab legs about four inches below your broiler or salamander. 2. Broil until heated through…about three to four minutes (time depends on the thickness of the legs and the strength of your broiler. Hot crab legs are delicious served with drawn or clarified butter, mayonnaise, aioli, or a vinaigrette.